This luxurious beachfront holiday house features oceanviews, four bedrooms, three bathrooms spread over two separate levels offering privacy and comfort for up to eight guests. Relax by your own private swimming pool or enjoy a family barbeque on the outdoor dining pavilion with views out to the ocean and the pool. This exceptional family retreat is awaiting your next family holiday. This purpose built two storey beachfront holiday house offers boasts privacy and comfort for holiday guests. Enjoy the tropical lifestyle with the open plan living area centered around the large timber deck and pool area. Facing west towards the tropical mountains the swimming pool offers a sunny aspect, protected by the trade winds - great for a refreshing swim after a day at the beach! Enjoy dining alfresco in the poolside pavilion with gorgeous views out to the ocean, and easy access to the fully equipped kitchen and BBQ facilities. With glass louvres and doors the beach views can be enjoyed from the ground level living area and dining room. Prepare a family meal in the fully self contained kitchen, complete with dishwasher, oven and large central bench - perfect for serving an afternoon platter. On the ground floor, bi-fold glass doors open from the living area to a beachfront timber deck, complete with outdoor shower and direct access to the beach. A Queen master bedroom with private ensuite and views out to the beach are situated on this level along with toilet and laundry facilities. Upstairs, the second Queen master bedroom features stunning ocean views and ensuite - both master bedrooms offering privacy and comfort. The third and fourth bedroom, also located on the upper level offer a queen bed and a king split bed and share a family sized bathroom. A second living area on the upper level offers a relaxed space to enjoy a movie with TV, DVD player, Foxtel (Cable TV) and wireless internet. With verandahs on each side of the house the ocean breeze keeps the beach house cool during the tropical seasons, and offers several spaces for families to enjoy the tranquility. Thinking of a Port Douglas wedding? Then talk to our Port Douglas wedding specialists and they can arrange all your wedding guests group accommodation and all pre-post touring. Experience the stunning beauty of the Great Barrier Reef with a day trip snorkelling or scuba diving - or perhaps relaxing on a stunning sandy cay at Low Isles. Day trips depart from the nearby Marina in Port Douglas, and must be prebooked. Walk amongst the world heritage rainforest of Daintree National Park, or maybe view the Rainforest from the air in a Scenic Flight. Get up close to the local animals in Port Douglas at the Wildlife Habitat, or feed a crocodile at Hartleys' Crocodile Adventure! Private fishing charters can also be arranged departing from Port Douglas. With so much to experience on your Port Douglas holiday - ensure to speak to our holiday consultants to help you arrange your memorable family holiday! Port Douglas offers a wide selection of dining options featuring local tropical produce, enjoy a coffee at one the of local cafes, a relaxed dinner at an alfresco restaurant, or a fine dining experience - the options are endless. For holiday makers who wish to relax and cater themselves, a grocery store is located in the centre of Port Douglas. 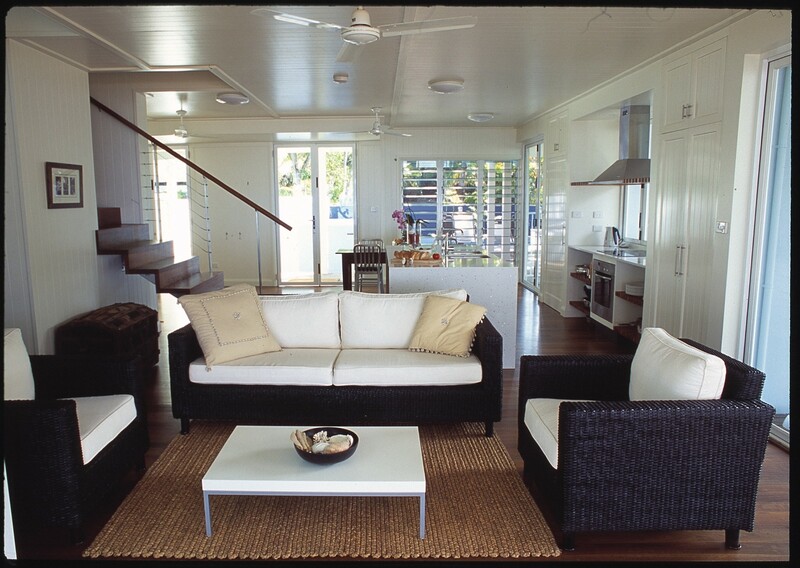 This luxurious beach house is located a short 10 minute drive from Port Douglas and 45 minutes from Cairns Airport. A Hire Car is highly recommended for guests staying at a holiday home to provide you with easy access to come and go from Oak Beach. Vehicles can be arranged for pick up on arrival at Cairns Airport so you can drive directly to your holiday house. On the way are two shopping centres offering grocery shopping, butchers and all your holiday essentials. Port Douglas Beachfront Holiday house is Managed Offsite - Office located in Macrossan St Port Douglas Open 9am - 5pm Mon - Sun. Please ensure to advise arrival details to arrange key collection. Cot/High Chair Hire $10 each p/night payable on arrival. Looking for the ideal beachside holiday home, The Pines at Oak Beach offers one of the finest holiday venues available. Located mere footsteps from the sand of one of Australia’s most exclusive and popular holiday destinations at Oak Beach, this luxurious two storey, purpose built house was specifically designed to accommodate up to eight people with an emphasis on equal privacy and comfort for all guests. The downstairs living area is centred around the large deck and pool area, the perfect spot to relax and take in the beauty of tropical Far North Queensland. Facing west and protected from the trade winds, the pool area is sunny and sheltered with views of the surrounding rainforest. The outdoor dining pavilion which has views of both the pool and the ocean is serviced by the nearby fully equipped kitchen and barbeque. Also on this lower level, with direct ocean views, is a lounge area with convenient deck access as well as the queen master bedroom with en-suite. A laundry, toilet and outdoor shower also feature on this downstairs level. Make your way up the timber staircase and here you will find a second lounge area (television, Foxtel, DVD player and wireless internet), as well as verandas on each side of the house. A second queen master bedroom can be found here with stunning ocean views and an ensuite. The third and fourth bedrooms featuring a queen sized bed and a king split bed respectively are on this upper level and share a family sized bathroom. Renowned for its exclusivity and privacy, Oak Beach is located just ten minutes south of Port Douglas. Oak Beach is the ideal place to enjoy the local attractions tropical North Queensland has to offer before returning to solitude and relaxation. Beautifully furnished, this absolute beachfront home is the perfect retreat for the whole family to enjoy. Enquire today. Very good; everything was arranged perfectly and my sister and her friend from Canada were enjoying the timely plannings.